These very large birds are the tallest in North America, and save for their red crowns, black masks and black primary feathers (on their wings), are almost entirely white. The world's only wild and self-sustaining population breeds in Alberta and N.W.T. 's Wood Buffalo National Park, wintering on Gulf of Mexico coast in Texas. They seek out grasslands with abundant ponds, lakes and marshes. The whooping crane has come so close to extinction that I guess I'm voting for the underdog, especially since it looks as though the loon is a shoo-in. If it were our national bird, perhaps all the extra attention would encourage Canadians and others to ensure its survival.The whooping crane is a noble-looking bird, right up their with the great blue heron. I fell in love with whooping cranes after a research project in 1972. Later in my career as a curator at the Calgary Zoo's Conservation Centre, I was privileged to work with dozens of whooping cranes. With help from donors and partners such as Environment Canada, the Calgary Zoo is propagating whooping cranes for release to the wild. Young whooping cranes are sent to the United States to form new flocks just in case the wild population falters. Whooping cranes are symbol of successful international conservation. The world's population is now more stable but there are new and serious threats to their survival. It's important that we save our wild habitats and protect endangered species like the whooping crane. One of the great recovery projects of my time. I'm voting for the Whooping Crane because it has made a slow but steady comeback - a little like Canadians after 10 years of Harper. It is a beautiful, tenacious creature that would grace any coin or currency bill with its unique and stunning silhouette. The whooping crane's graceful stature and noble bearing earn it universal admiration as an object of beauty and nobility. As a national symbol for Canada, it confers upon the country not only its own elegant qualities, but also share the colors of the national flag. Besides these outward agreements of qualities and colors, is that the whooping crane is one of the great successes of conseration, and it is an achievement of which Canadians merit others' admiration. The only wild flock in the world breeds in Wood Buffalo National Park, they have an inspiring conservation story, and they are beautiful, majestic, and coloured red and white.... what more could you want for a Canadian national bird? North America's tallest flying bird, the Whooping Crane, is a great symbol of conservation and cooperation between countries. Without the protection of pristine Boreal forests and wetlands in Wood Buffalo National Park spanning Alberta and the Northwest Territories, the Whooping Crane would have become extinct long ago. The perseverance and creativity of the biologists with the Canadian and U.S. Governments have saved this species as an inspiration and symbol of wildness for future generations. Whooping cranes are returning from the brink of extinction! They are rare and magnificent birds with an inspiring story. Their survival is made possible by the hard work and partnerships of many wonderful individuals and organizations. They are a symbol of survival and the power of dedication to a cause. Whooping cranes serve as an reminder of the wonderful things that come from working together across political boundaries and philosophical differences. Endangered and in need of more publicity! Every single word that gets out about the Whooping Crane is step in the right direction. I love whooping cranes because they are elegant, wild, and endangered. I first saw them on Matagorda Island, Texas, and they stole my heart. The whooping crane is the definition of conservation and a wonderful comeback. We always stop in our tracks and watch them fly over head when we hear them. Le plus grand de nos oiseaux et un des plus rares. Signe de beauté par sa blancheur et représentant de toutes les espèces susceptibles et menacés. The Whooping Crane is a truly great Canadian comeback story. Rescued from the brink of exstinction,this bird of peace was standing guard over our nation from almost the dawn of time. As we Canadians have stood guard over other nations as well, as our own, on so many Peace Keeping missions all over the world. Cranes in our native lore also are held in very high esteem, making them the natural choice for our natins bird. A bird that crosses all cultures around the world actually. The Whooping Crane with his size and specially the colors: White & Red like our flag make it in my heart the official bird of Canada. This bird is an example of survival. Like canadians, he is magestic, strong and beautiful. Not another birds could represent canadians. Please make the right choice..thank you. Internationally recognized as a conservation success story. Large distinct bird, easily identified. May not be found across Canada but nonetheless is only found in its summer range in Canada and nowhere else! Illustrates that sometimes Canada and the US can actually work together against all odds to create a hugely successful result. We have lead in protecting this Magnificent Creature from extinction...a SYMBOL of our caring for Nature! I thought of the loon at first, but when I thought of the whooping crane -- well, what a good symbol. Nurtured back from the brink of extinction (just a touch) -- just shows what you can do if care. The Whooping Crane has been brought back from the brink of extinction and is still fighting for its life. This would be a wonderful way to remember this iconic bird. 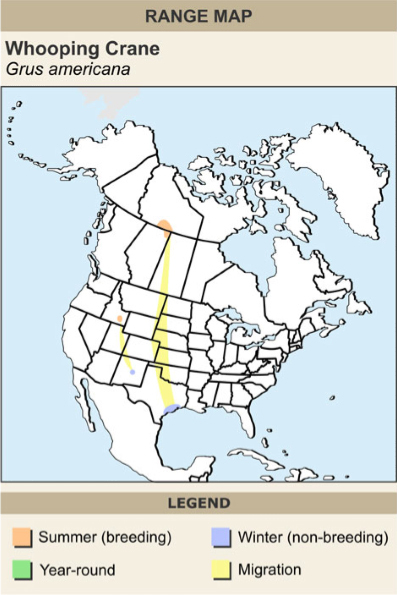 The Whooping Crane is the only bird on these lists that nest exclusively within Canadian borders. It is also a great symbol of how we can bring a vanishing species back from the brink of extinction. Although some of the other birds are "prettier" or better known, they are common in other parts of the world, and some are already state birds. It was down to only a few (one digit number). Thanks to the incredible work and perseverance of a few, they are on the rise. Don't know how many now, hopefully in the three digit range. I did some clerical work for Ernie Kuyt who was with the government working on this project (wildlife). I've never seen the bird except for pictures but it is a North American wonder. I think to be able to see and hear them in the wild would be fascinating. To lose them (to become extinct) would be so sad and also a disaster. Story of strength, determination for survival over tremendous adversity. This beautiful bird is one of the ultimate symbols of inspiration. A bird that almost became extinct, until heroic efforts by many people established a breeding program. The population has suffered several mishaps along the way, especially on their migrations to the southern US, especially Florida. It's red and white, like our national flag. It's tall and dominant and loud, a national symbol of conservation. It also has a sentimental meaning to me. I come from the boreal forest of northern Alberta Wood Buffalo National Park. To me, they are a sign of home, in every sense of the word. Going down the river in a tin boat, watching them grace the sky. There aren't many less, so perhaps naming them a national symbol would put the urgency in protecting and sustaining them. This stunning and exceedingly rare bird that traverses the continent from the far northwest to Texas. Canada has a unique responsibility to preserve, protect and celebrate this incredible species. The whooping crane is a survivor and very large and graceful. It has presence, but I still like the Canada goose the most. 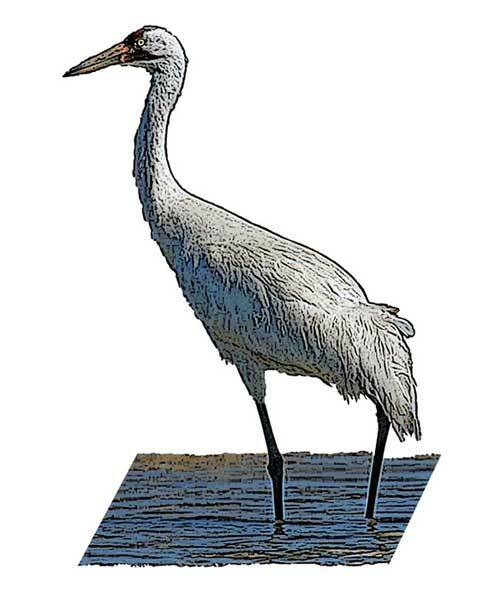 I chose the Whooping Crane because of Canada's efforts to save this endangered bird from becoming extinct. Stands for conservation and how we brought it back from extinction, and a constant reminder to us to make room for all species of wildlife in our country so we can lead the world to do the same. I have no proof or alibi of this, but in June 2013, I witnessed an adult whooping crane with one juvenile in the swampy, rolling, treed habitat about 1 km inland from the southwest shore of Cow Lake, Alberta. They were not Sandhills Cranes - this one was much larger, all-white and its vocalization was noisy, not comparable to anything I have heard before. This is a rich habitat that is being encroached upon by oil leases. The fact is that I ran over the juvenile on a lease road and the adult flushed out from nearby. This incident crosses my mind almost every day. Excuse my comment on the Harris's sparrow picture, there are three species of bird that only breed in Canada, and whooping crane is another; the Harris's sparrow is the only passerine, and the Thayer's gull is the third. The enigmatic and highly endangered whooping crane makes its summer (and breeding) home in Canada's Wood Buffalo National Park, an area that was NOT set aside for the whooping crane, but for the wood bison that are native there. The crane's summer range was a mystery until the mid-20th century when a chance sighting by a helicopter pilot settled the question. The world's only natural wild flock of apx. just 300 whooping cranes use the western Canadian wetlands exclusively as their breeding grounds, making use of the remote location and abundant marine food to successfully rear their chicks. Without the pristine wetlands of Canada's wilderness, the whooping crane could not be making the slow, steady, and encouraging progress it makes today! I believe the whooping crane should be the national bird due to the fact that the organization that is working so hard to bring this great and beautiful bird back from almost the very brink of extinction was started in Canada (Operation Migration), and most of the wild birds alive today summer [breed] in Canada and then migrate to the Texas area in the U.S. during the winter months. Operation Migration has been working very hard for the last 12 years or so to create an eastern migratory group of whooping cranes that summer in Wisconsin, and is led by ultra-light aircraft to St. Marks, Florida, for the winter months. More and more publicity about these endangered cranes, hopefully, will bring more and more help with successful increase in total numbers to make these two groups a self-sustaining breed of birds. This magnificent bird is being followed by people, including school children, around the Americas and beyond as it survives in spite of low numbers. Through the efforts of volunteers and others to support this bird increasing its numbers, many individuals and groups are paying attention to the environment as never before. Entire classrooms of children will grow into adulthood remembering the effort to keep this bird growing and thriving. The whooping crane is a magnificent creature, powerful and charismatic. It demands respect with its presence. Several years ago, I visited Jasper-Pulaski here in Indiana and I was totally blown away by the thousands of Sandhill cranes sprinkled with a few easily identifiable whooping cranes. I arrived before the sun came up but I could hear the beautiful and distinctive sounds of the cranes. The sun came up and much to my surprise and amazement, the cranes rose up out of the trees surrounding the meadow and flew toward where I was standing to land in the field to feed and gather together. That was my first experience with cranes and I will never forget it. I learned about Operation Migration and the whooping cranes soon thereafter, and even visited a crane festival in Necedah, WI, and joined the International Crane Foundation. I fell in love with the ancient birds and have been following them ever since. Two of your citizens, Joe Duff and William Lishman, started the Operation Migration program and flying ultralights with the whooping cranes. I had the great pleasure of meeting Joe Duff at the Crane Festival in 2007 and even got to see his ultralight in person. For a craniac, that is a big thrill. I hope you will consider using the beautiful whooping crane as your national bird. When I think of Canada the word majestic comes to mind, and the whooping crane definitely is majestic. The whooping crane is a beautiful bird, and while the United States likes to claim them as their bird because they winter in Texas, they really are of Canadian descent, as their breeding grounds are in Canada. A person's citizenship is determined by where they were born. So whooping cranes should be Canada's national bird. The whooping crane is the face of conservation and a great comeback story. The whooping crane has become the icon of endangered species in Canada, and it symbolizes hope and cooperation between Canada and the United States. It is a bird that hasn't given up, despite hitting an all-time low-population count of only 15 in the 1940s. If we can save the whooping crane we save its habitat, and that means safeguarding it for all the lesser species that rely on wetlands to survive, including humans. Wetlands are critical to our survival as well. I recall the time when this bird was precariously on the brink of extinction, and through an informed and united effort increased their numbers. Perhaps we need to do the same for the monarch butterfly and also the honey bee. The whooping crane is Canada's best conservation story ever! The whooping crane is one of Canada's, and in fact North America's, great conservation success stories. On top of that the whoopers are huge, majestic and elusive, just like many of Canada's top wonders! The only wild nesting flock in the world is found in Northern Alberta and Southern N.W.T., within Wood Buffalo National Park.